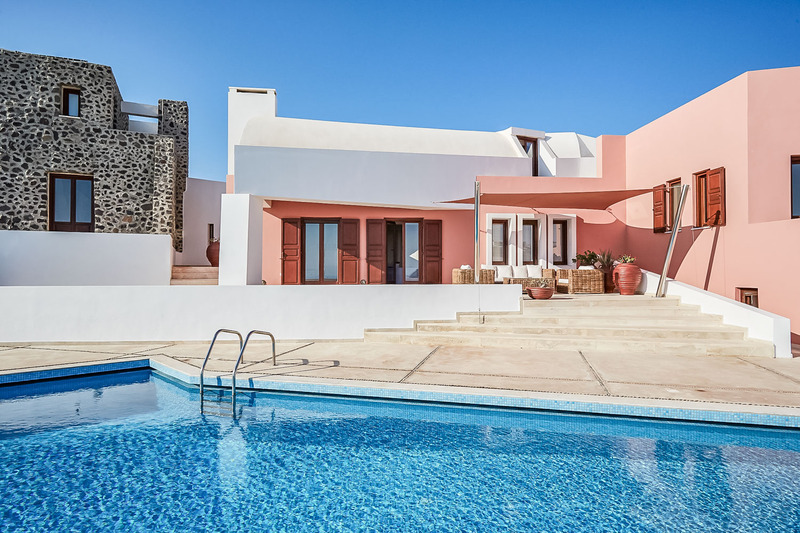 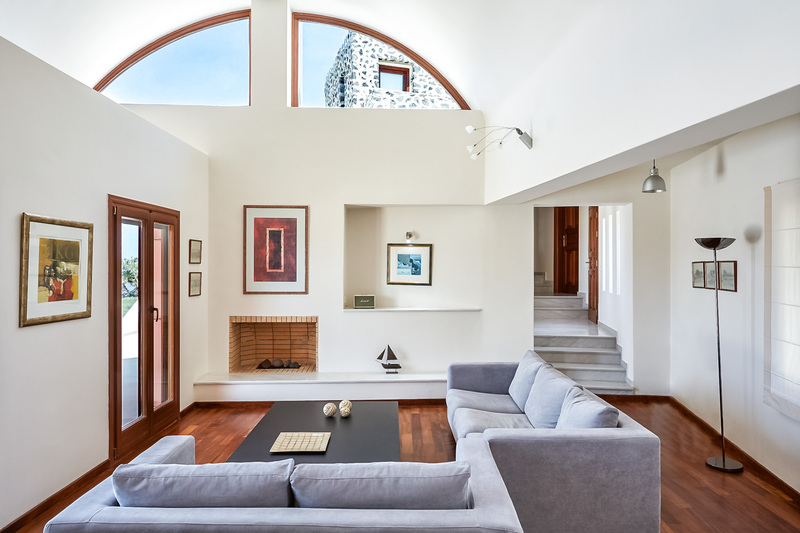 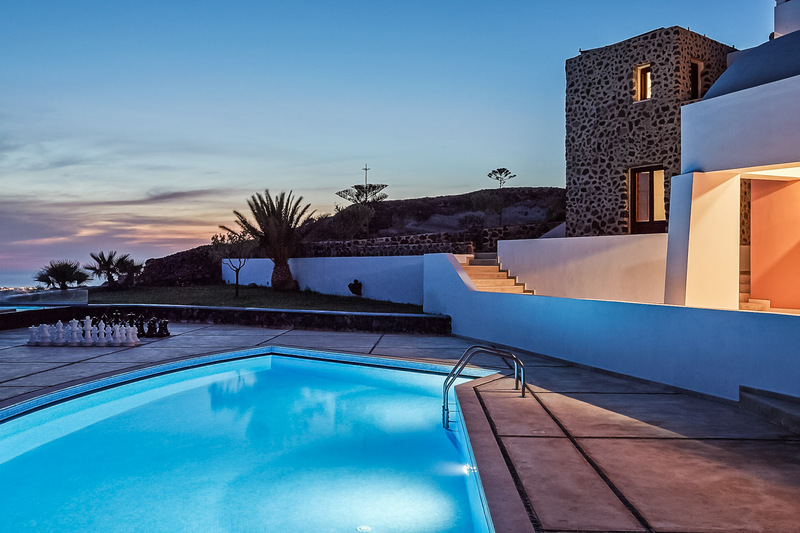 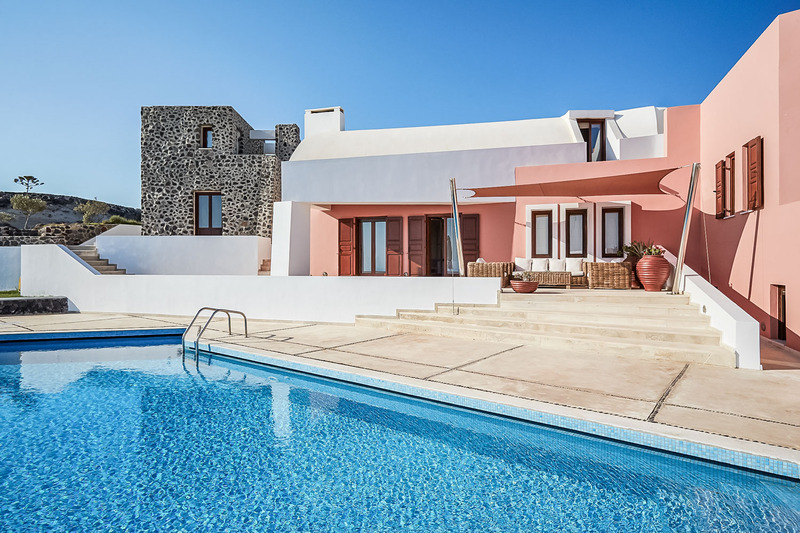 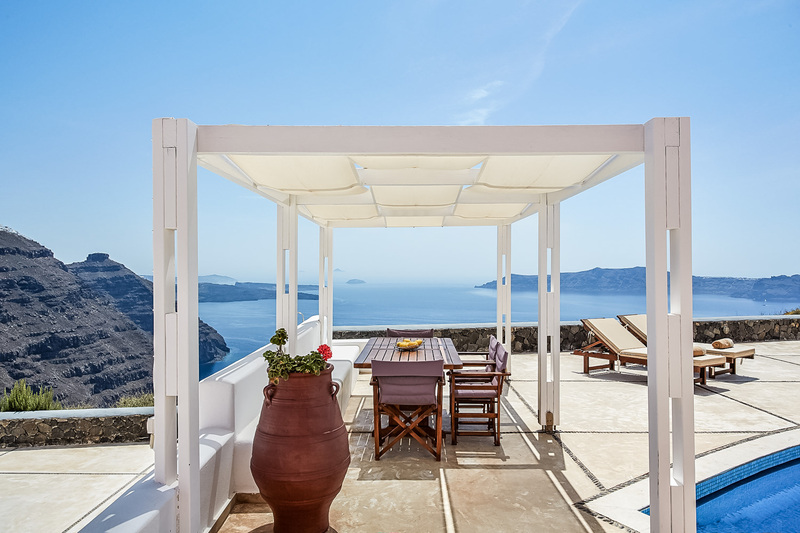 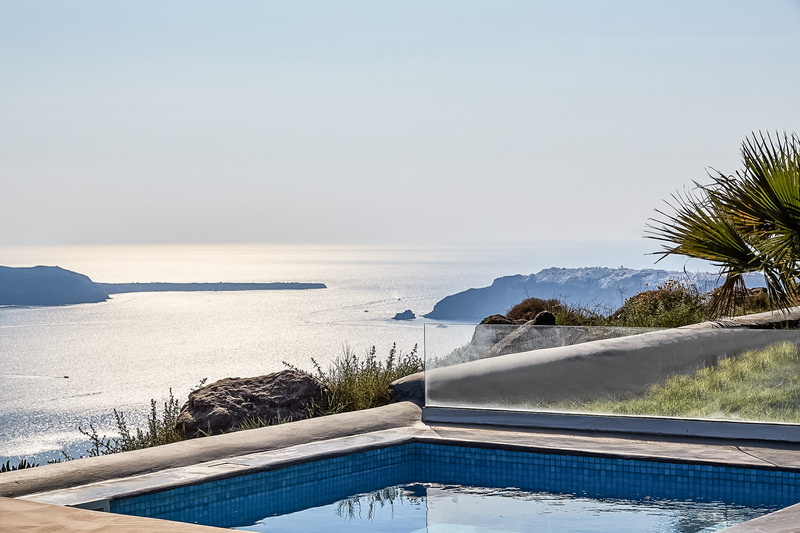 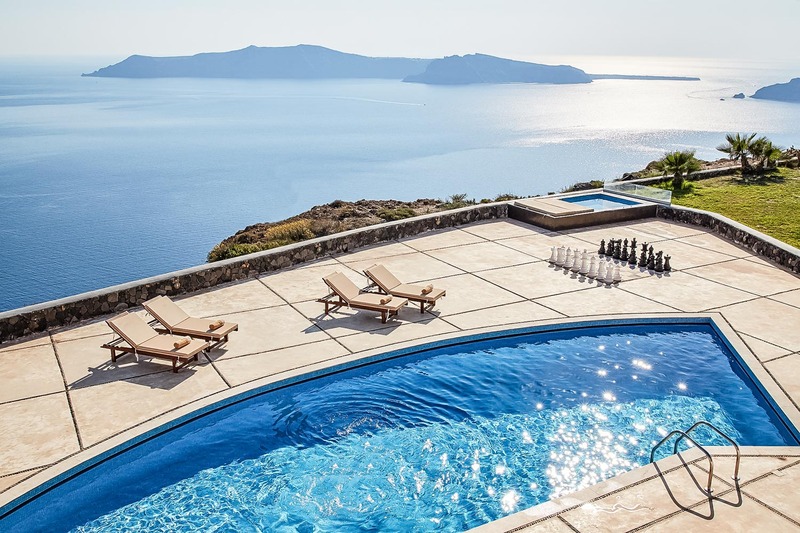 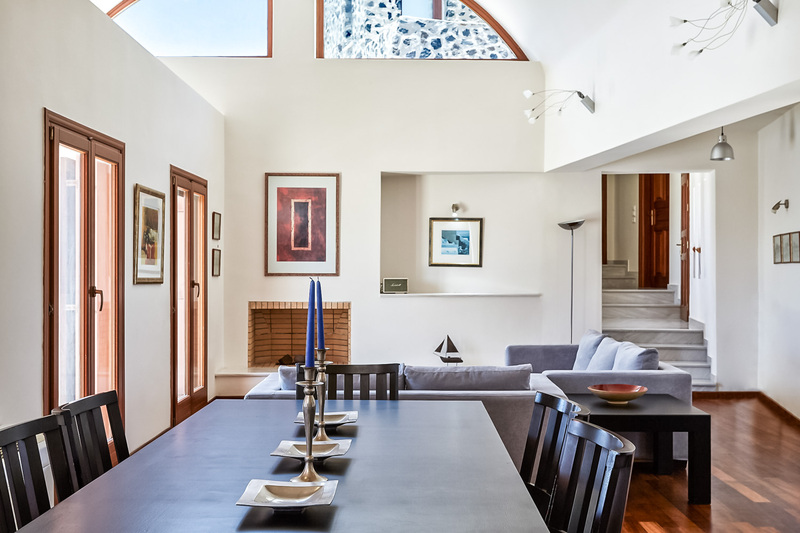 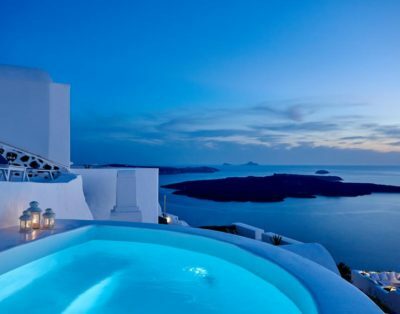 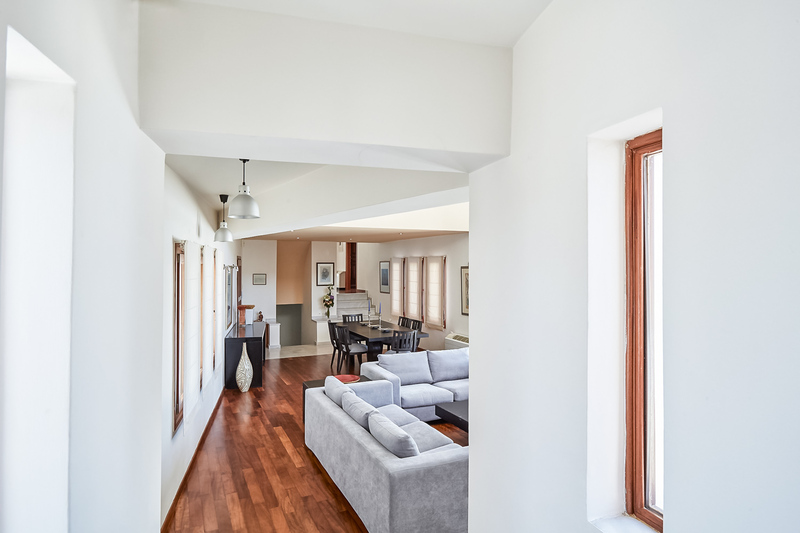 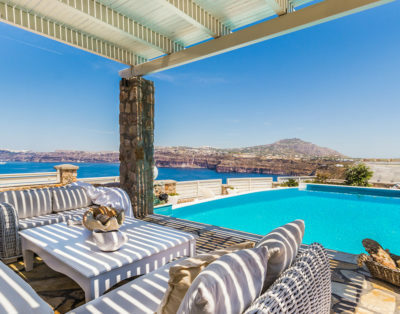 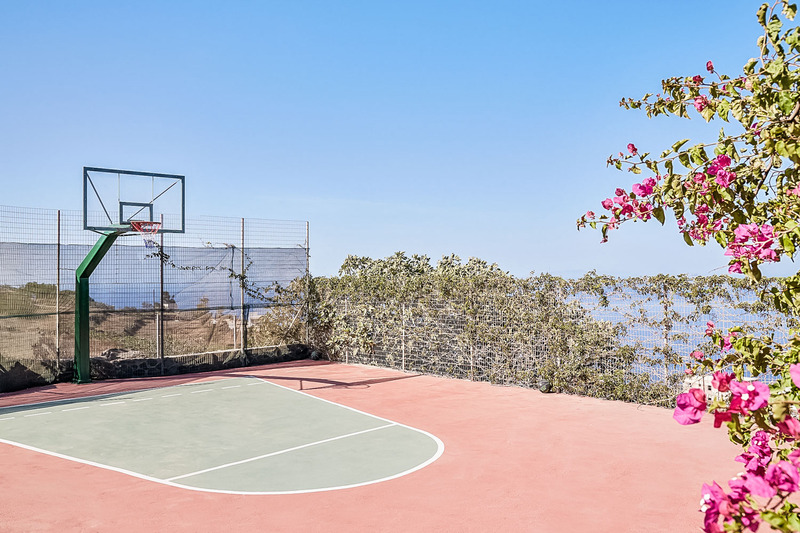 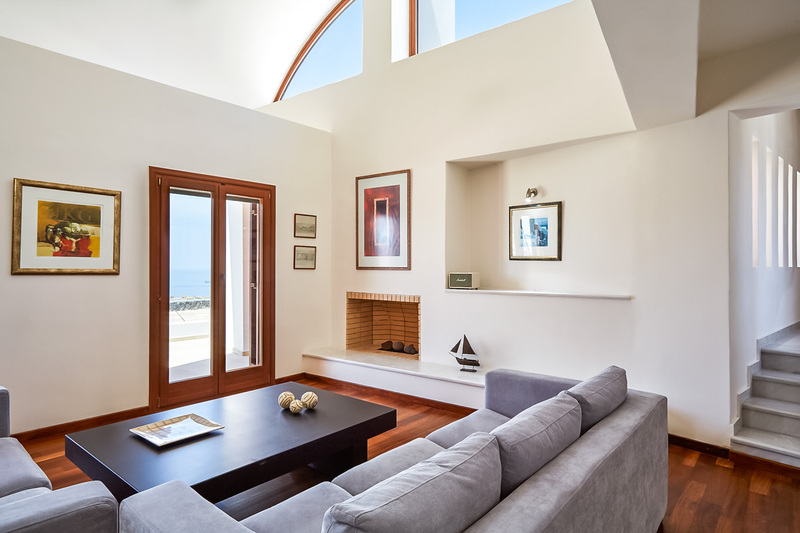 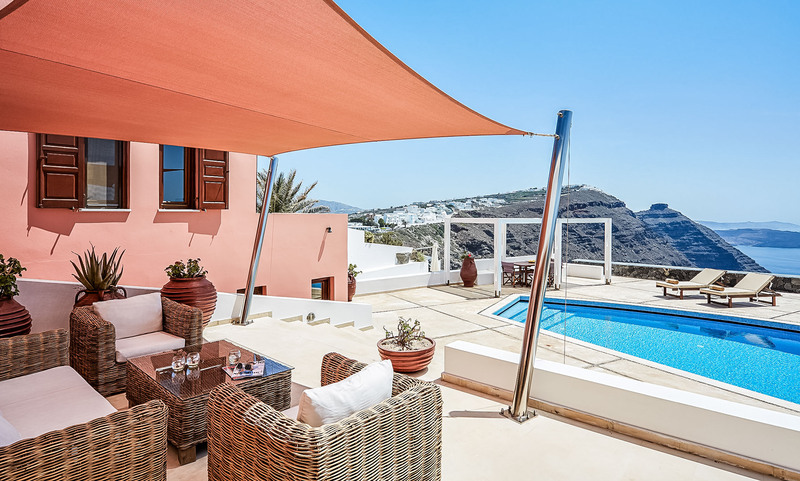 Periscope Villa in Santorini is a 5-bedroom ultra-luxury villa situated in a private land of 4000 sq. 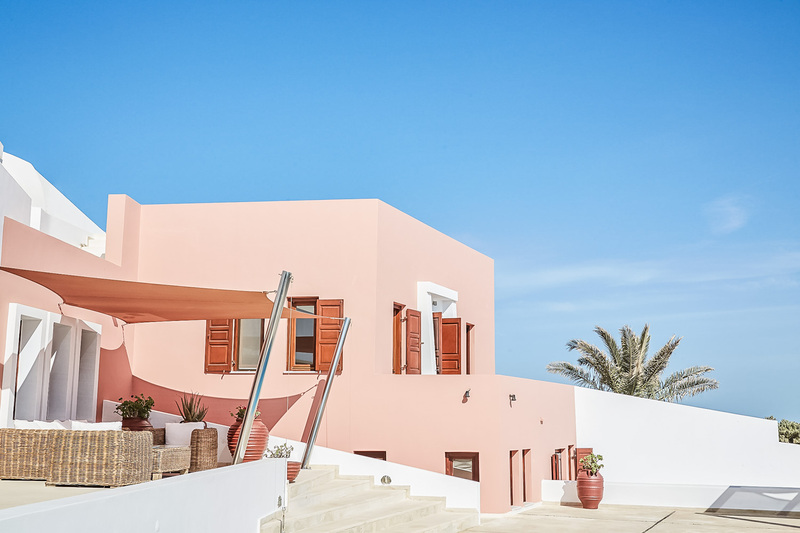 meters in Imerovigli overlooking the volcano and the sunset. 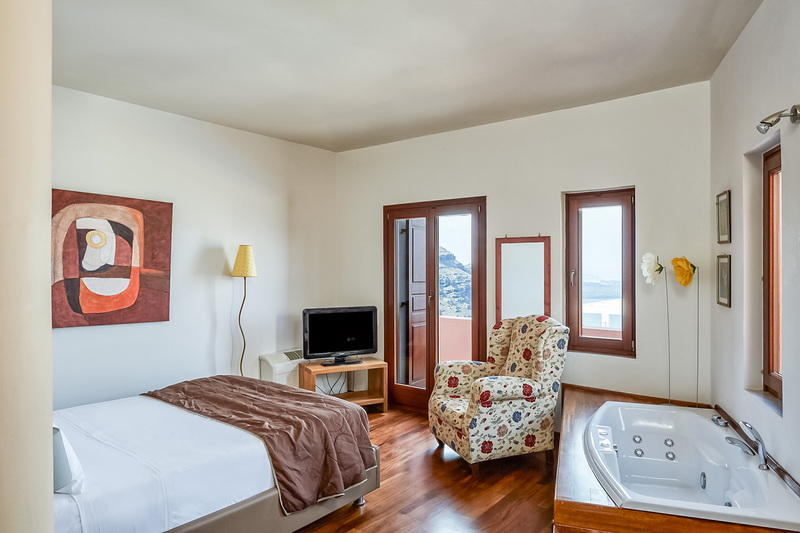 There is a second queen-sized bedroom with en suite bathroom with shower cabin next to the master bedroom. 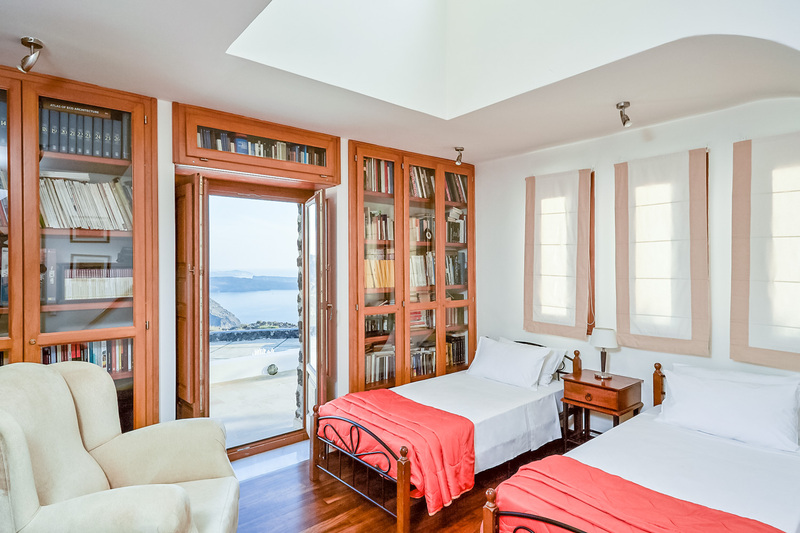 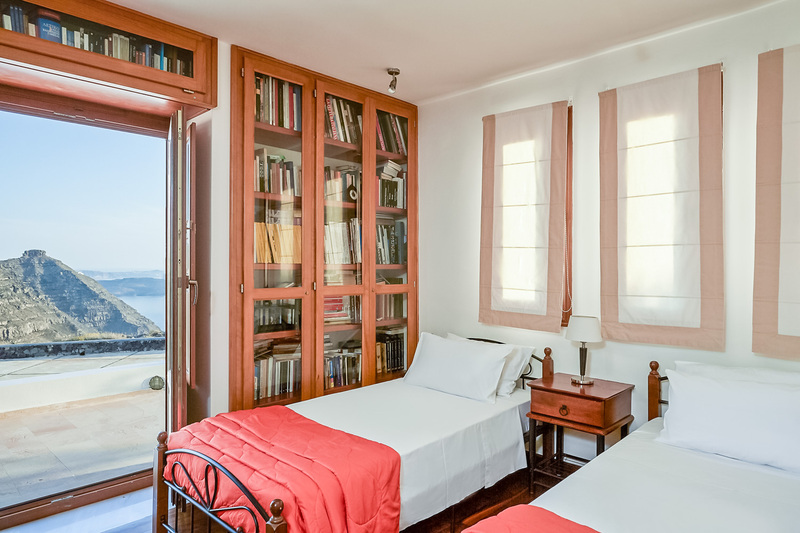 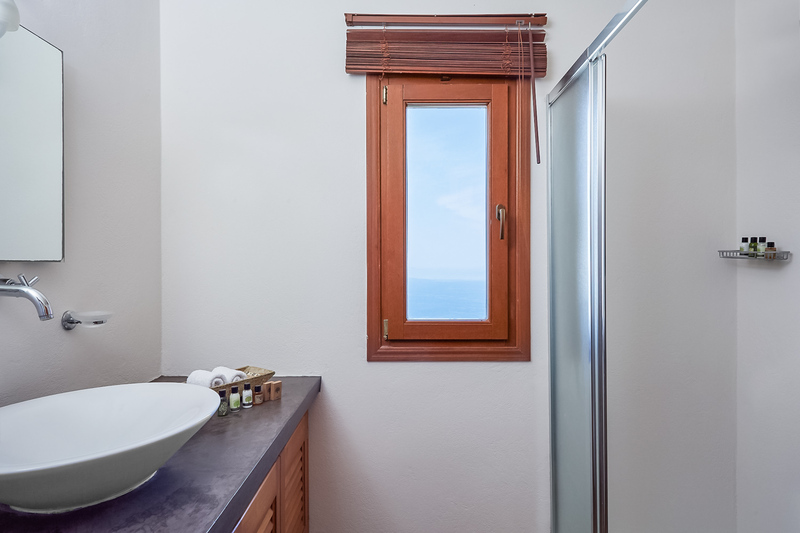 Both bedrooms have exit to balconies with sea views. 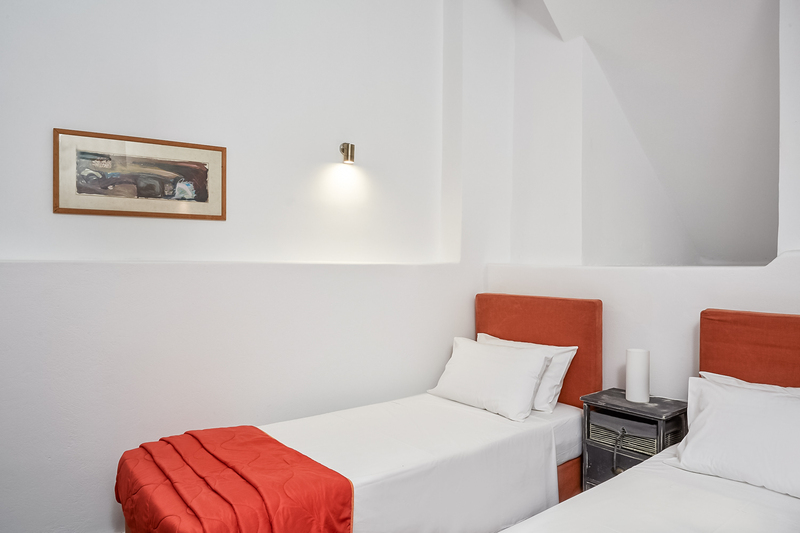 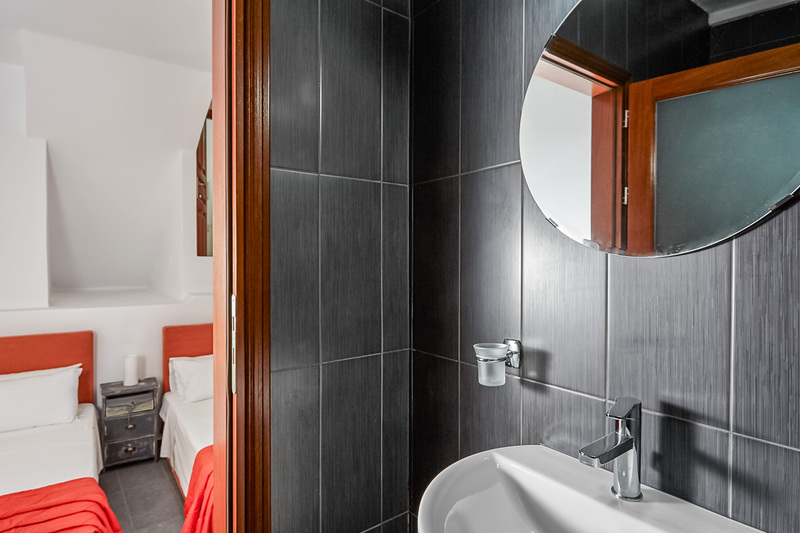 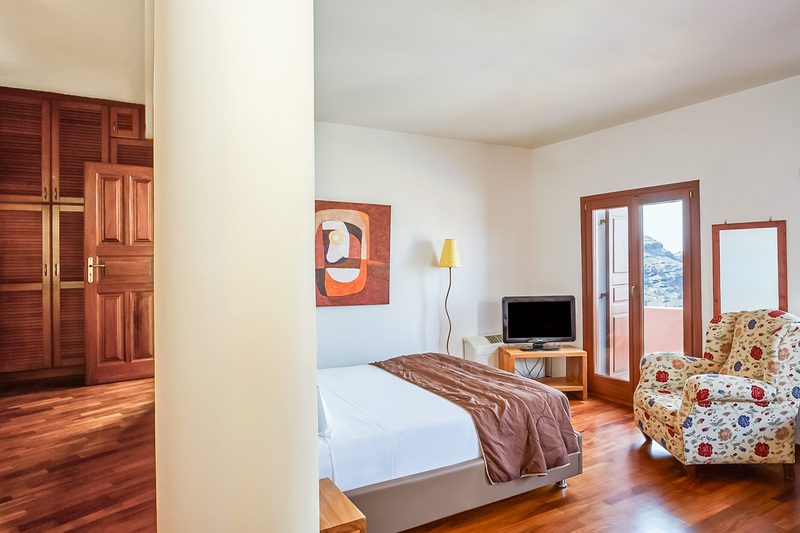 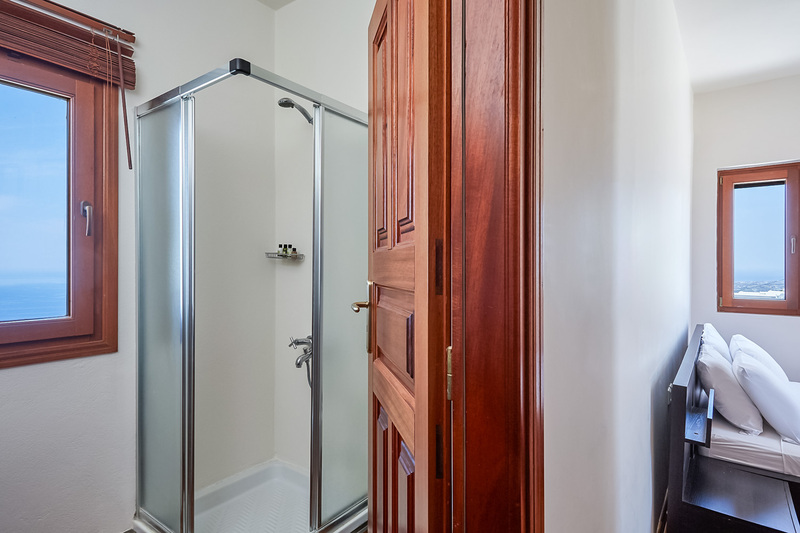 At the end of the corridor a door takes you down to a basement with a double room with two twin beds and en suite bathroom wit shower that can serves as extra staff bedroom or kids bedroom. 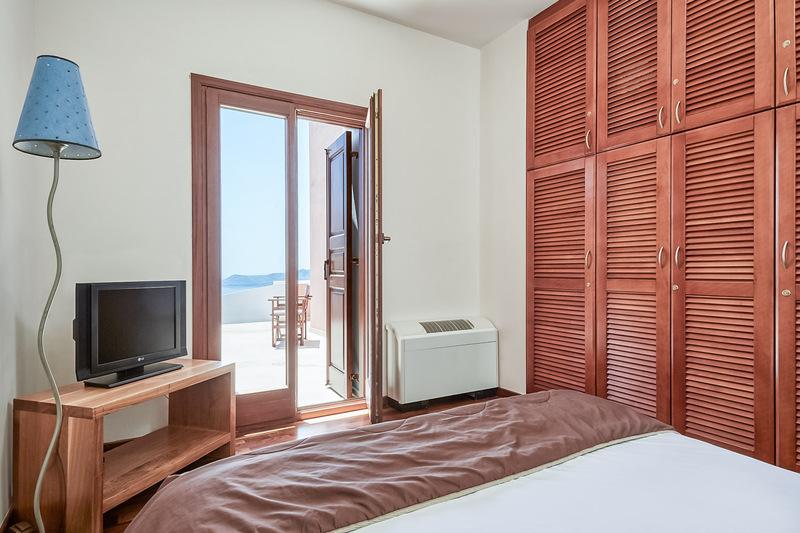 This double bedroom has no windows. 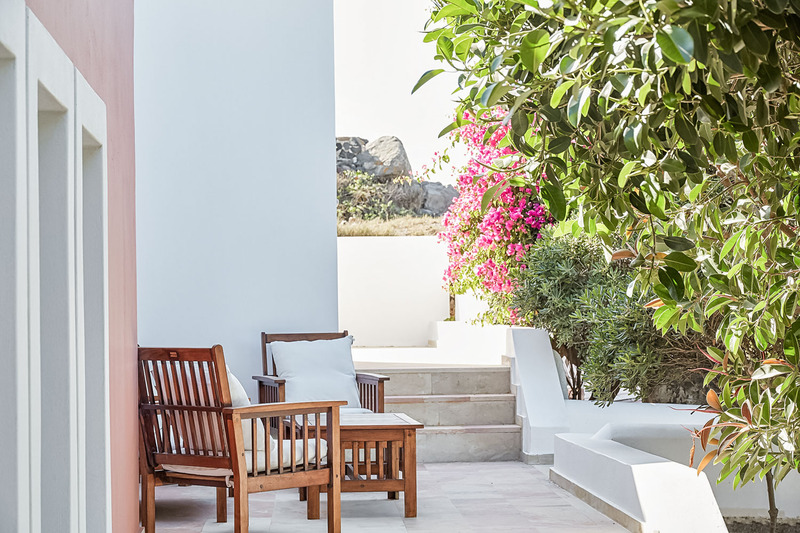 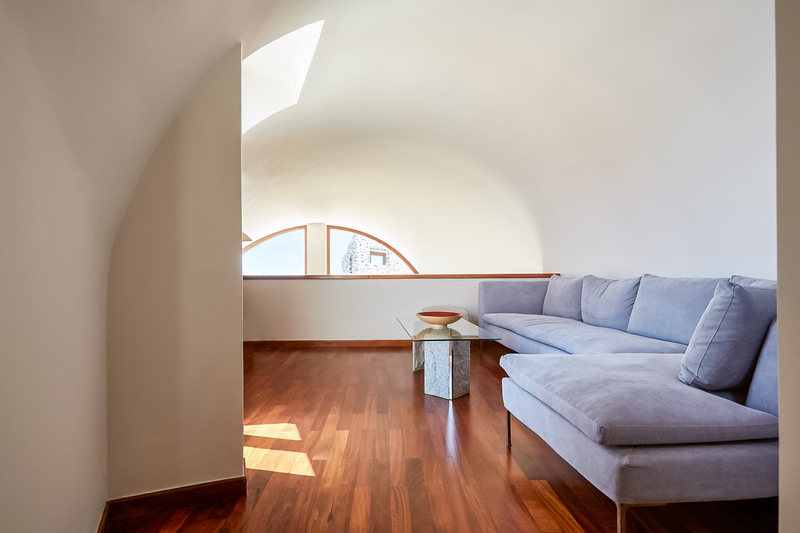 Except the corridor inside the house, the access to this room can be also from an independent entrance connected the back terrace of the house. 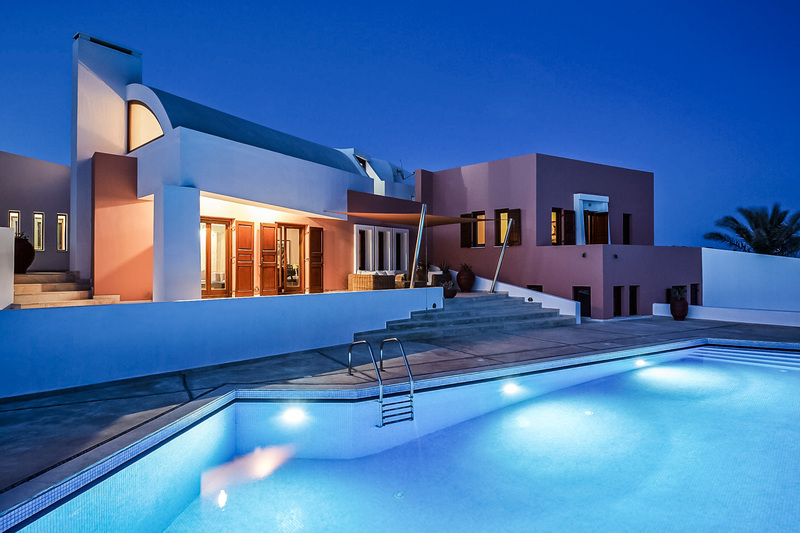 The house has large exterior grounds. 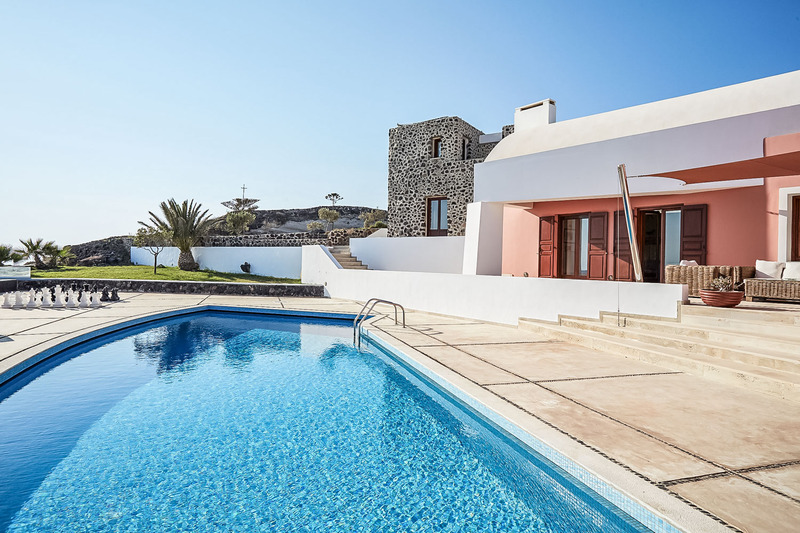 On the front there is a large courtyard with fantastic sea views and beautiful sunsets. 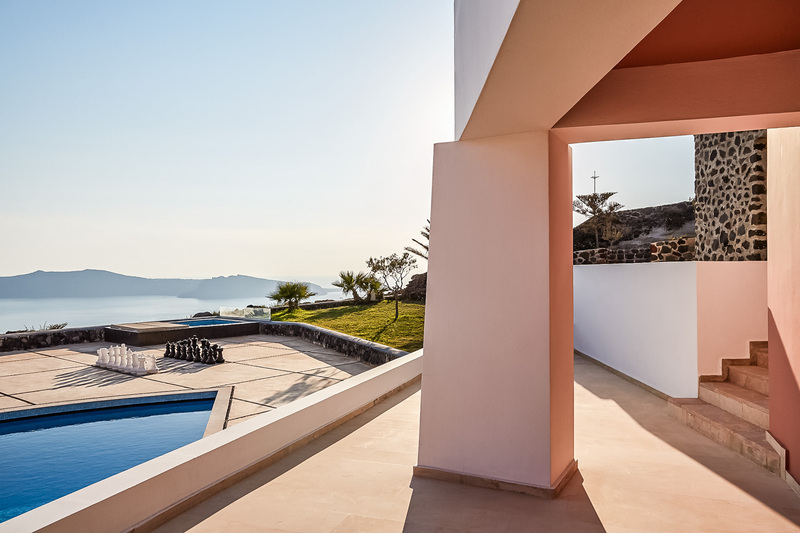 In front of the living area there is a terrace with an exterior lounger for relaxing moments. 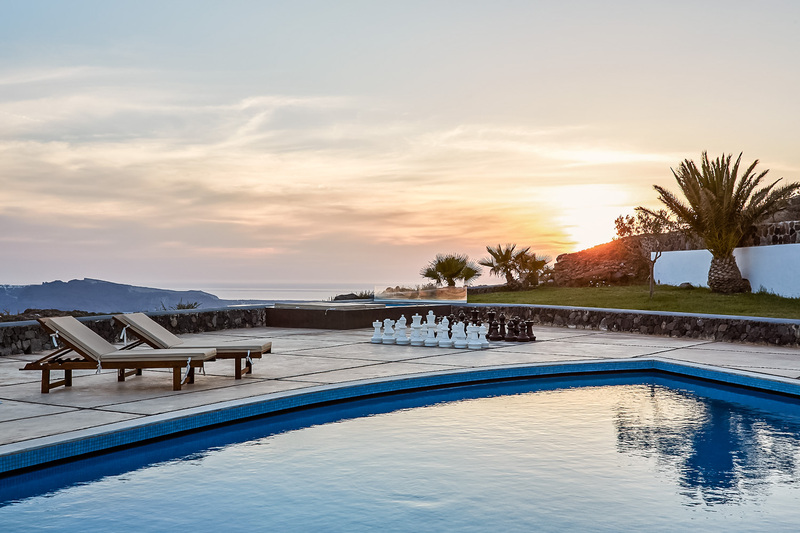 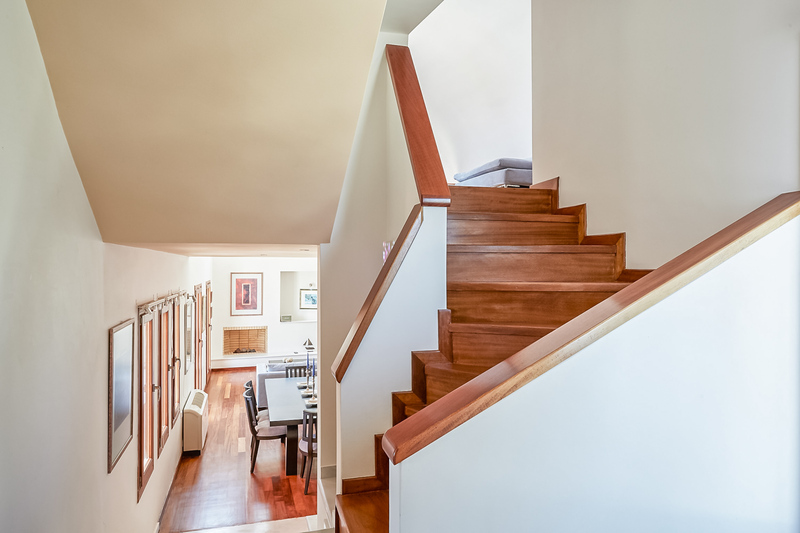 A few stairs takes you down to the pool level where you find a wonderful pool with sunbeds and a shaded pergola with table and chairs all these with the most fantastic views and sunsets. 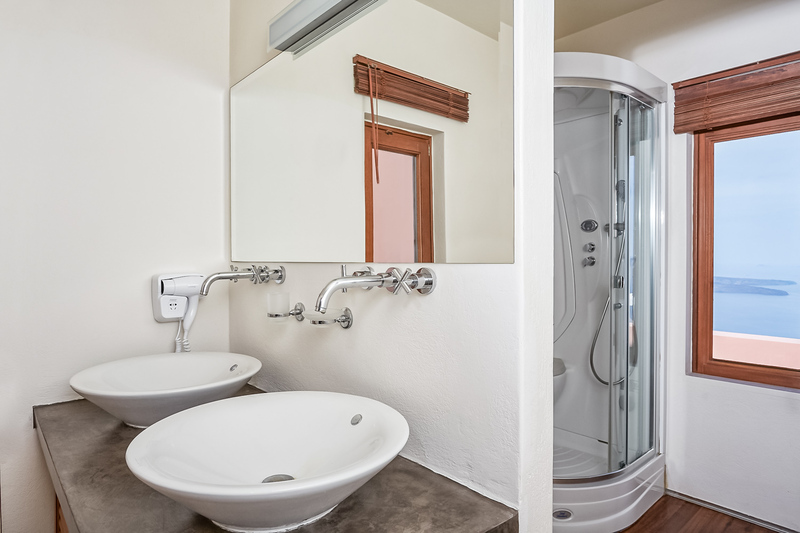 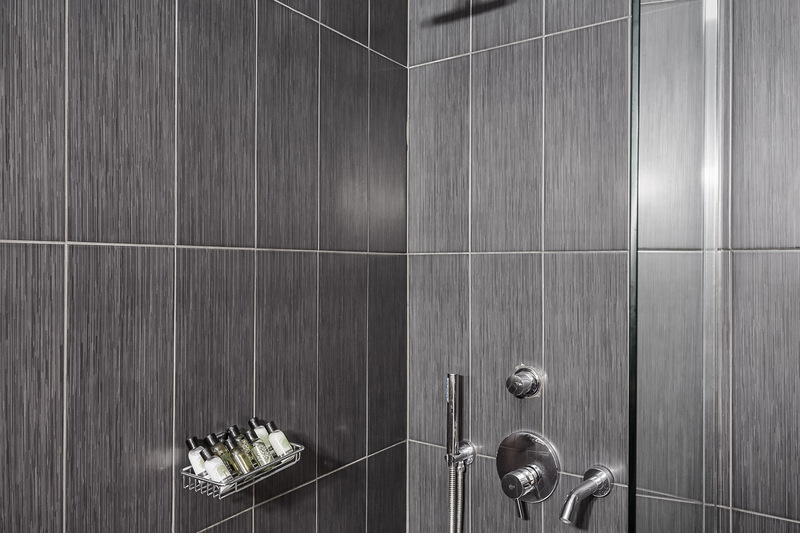 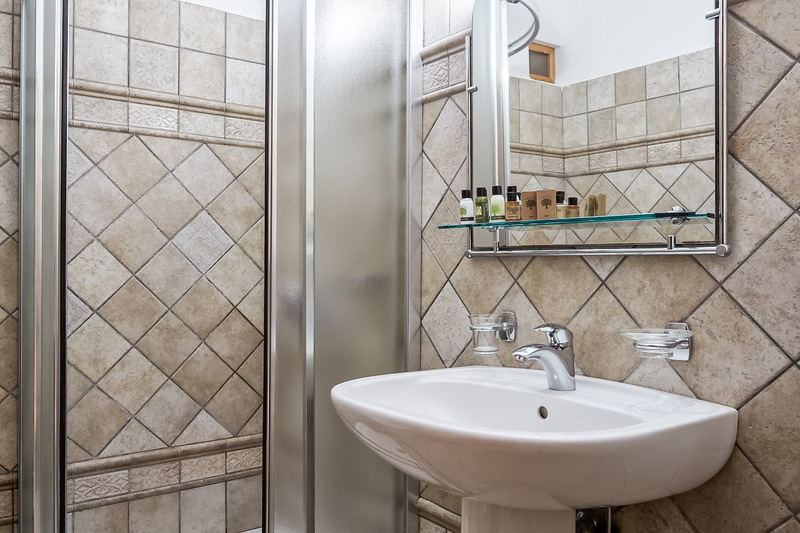 A pool shower is also available. 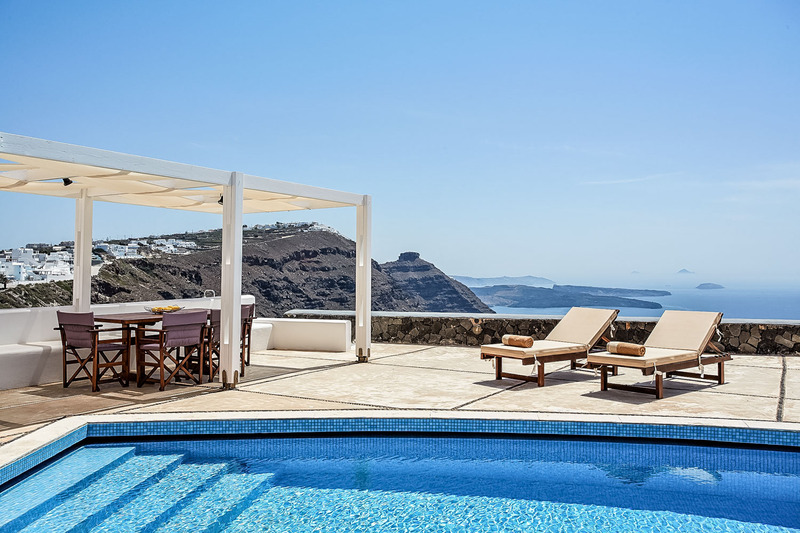 On the corner of the large terrace there is also a large heated jacuzzi plunge pool with amazing views. 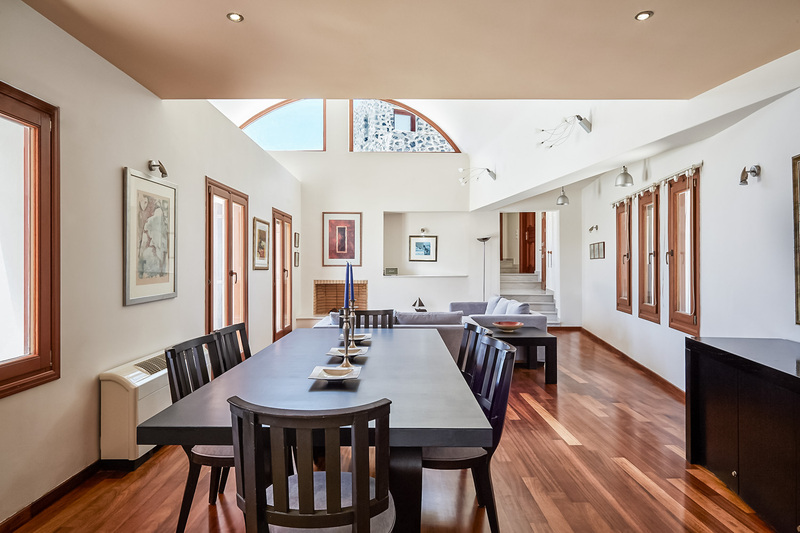 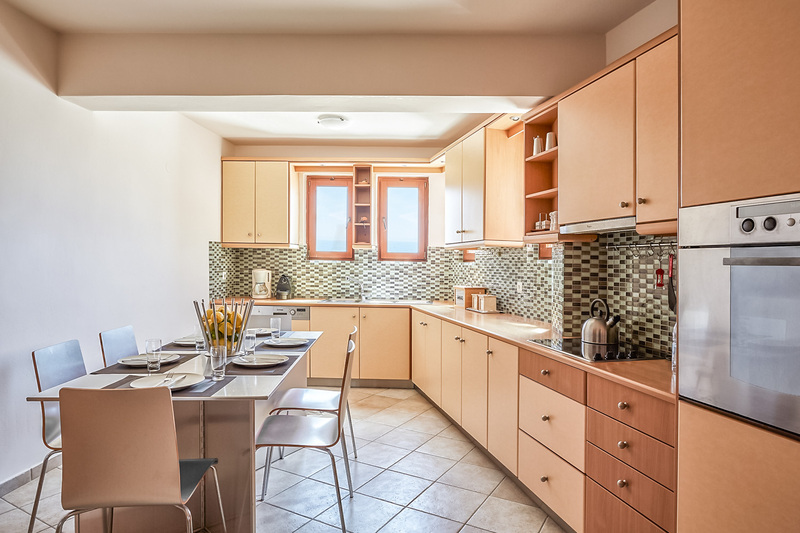 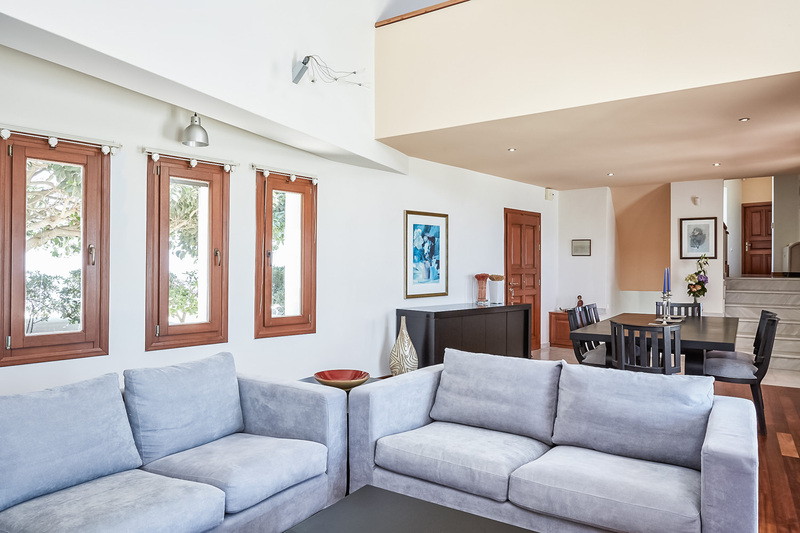 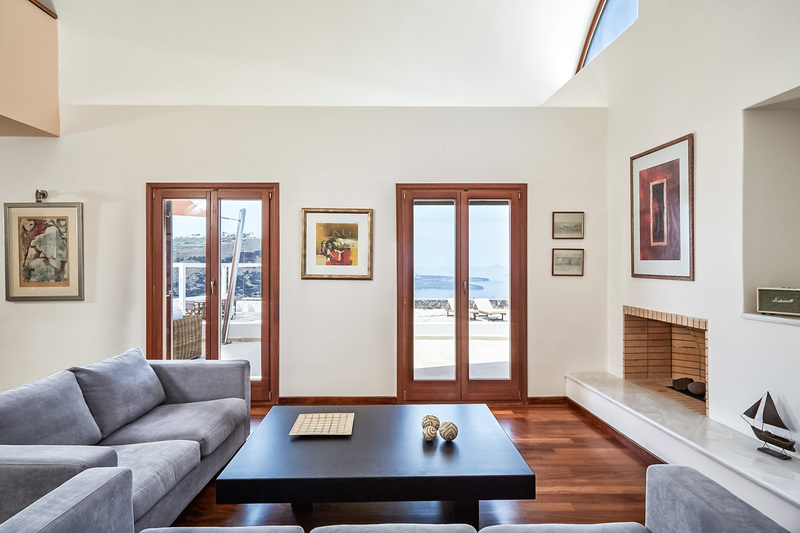 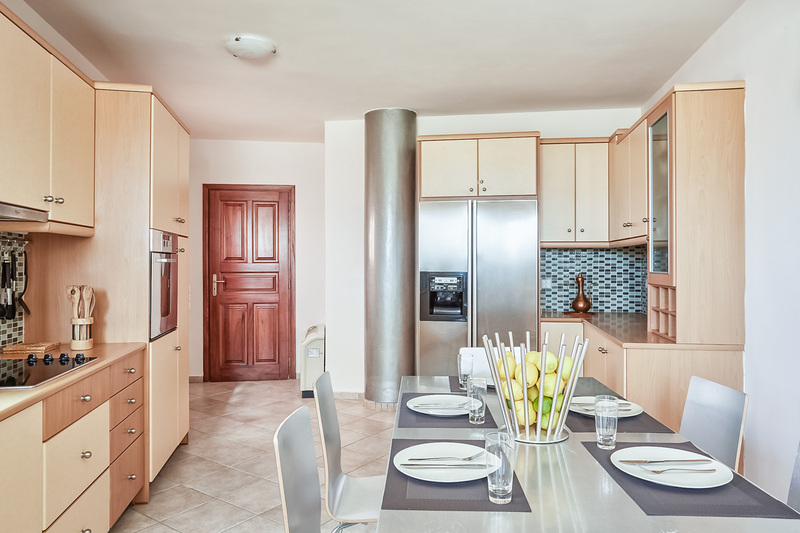 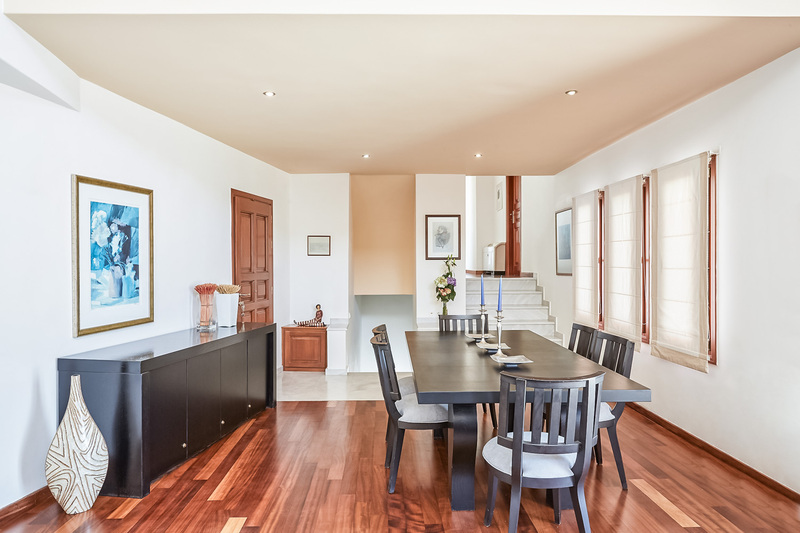 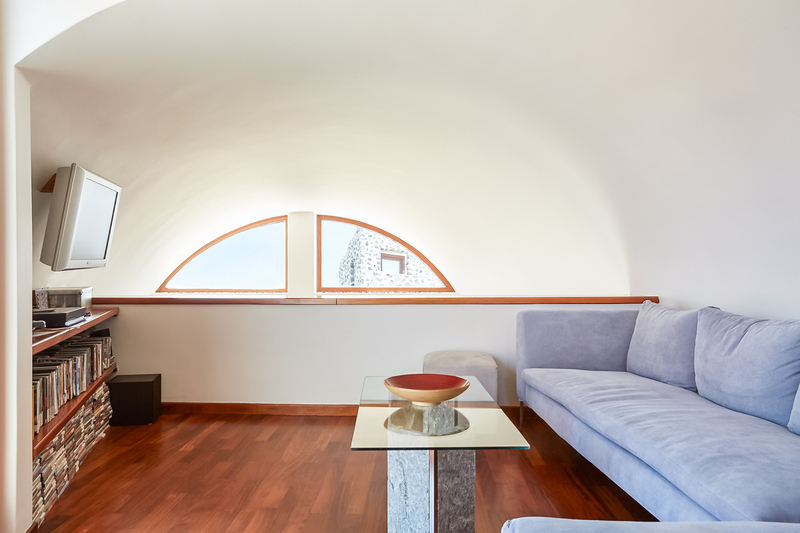 The house is equipped with wooden floors, Clima system – cooling and heating, Wi Fi, solar system and boiler with 24 hours hot water, energy saving systems, laundry room accessible by our staff, fireplace, hi – fi, satellite tv, dvd, home theater, private pool and separate outdoors Jacuzzi plunge pool. 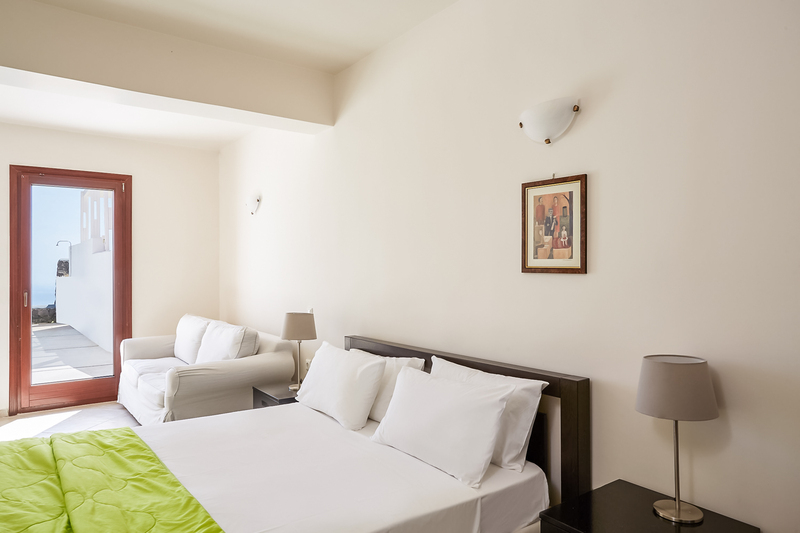 The rates include taxes, daily maid service; towels change daily, sheets change twice weekly, , meet and greet upon arrival and 3 loads of laundry per stay.